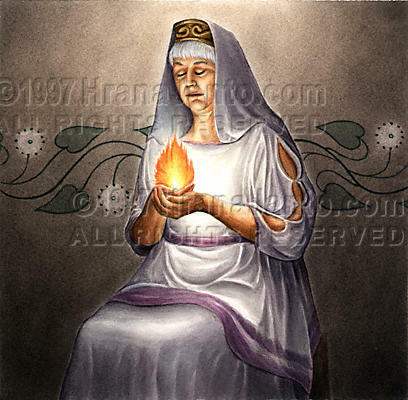 I painted Hestia in 1996 for The Goddess Calendar. There were never statues of this most ancient Greek goddess, for she took no human form. Hestia was seen only in the fire of the hearth, living in the center of every home, an honored guest and helpful to her hosts. As the hearth goddess, Hestia symbolized family unity; by extension, as goddess of the public hearth, she embodied the social contract. At this ever-burning public hearth, the prytaneion, she bore the name of Prytantis; there first fruits, water, oil, wine and year-old cows were sacrified to her. According to Greek legend, Hestia was the firstborn of the Olympian goddesses. Her antiquity is attested by the Greek proverb "Start with Hestia," meaning "Begin things at the beginning." In the beginning of her worship, matrilineal succession seems to have been the rule, and traces of it survived in the custom of classical Greece whereby a new home was not considered established until a woman brought fire from her mother's hearth to light her own. In the same way, Greek colonists brought fire from the mother city's public hearth to assure the cohesion of their new communities.